Port Columbus first began researching alternative fuels in order to fit within new, more stringent emissions standards that would take effect in 2010. Thomas Swackhamer, manager of parking and ground transportation, began exploring ultra-low sulfur diesel (ULSD), natural gas and propane-autogas-powered models to replace the airport’s fleet of older diesel-fueled passenger parking shuttles. In 2009, the airport tested its first propane autogas shuttle, a Ford F-450 cutaway. Port Columbus liked the performance and placed an order for four more the following year. 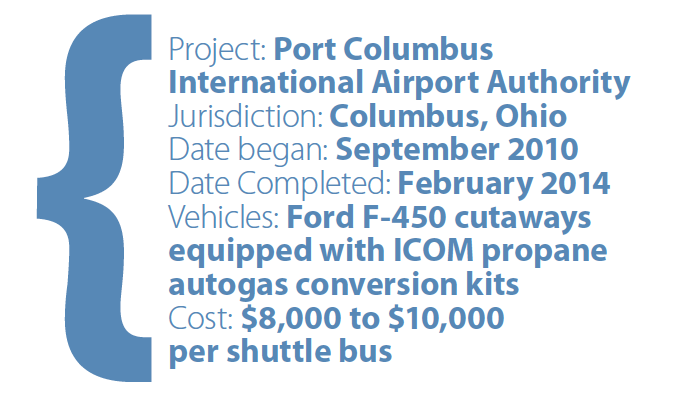 As of February 2014, the airport operates its entire fleet of passenger parking shuttles – 25 cutaways converted with ICOM equipment – on propane autogas. “The primary reasons we chose the fuel were its clean, green aspect, and that it fit into our existing sustainability plan. We also looked for vehicles that could be converted relatively quickly and could be maintained easily. Propane autogas had everything we were looking for,” Swackhamer says. 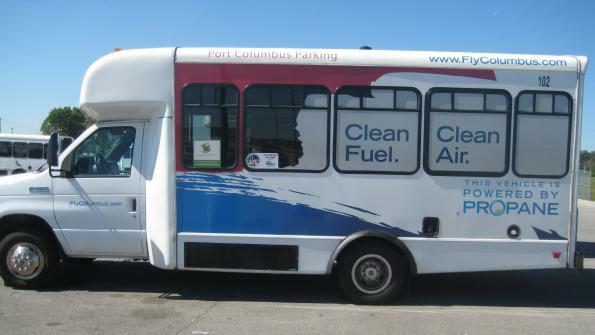 Port Columbus also tested other alt-fuel vehicles, including a ULSD bus, but they all had challenges and ultimately weren’t a fit for the airport. Port Columbus pays less than $2 per gallon for propane autogas, when compared with $3 to $4 per gallon for diesel. Fuel savings with propane autogas allowed the airport to recoup its upfront costs on all 19 conversions that occurred in 2013. After applying current fuel savings toward conversions, Swackhamer says the airport saved an additional $5,000 in 2013 with the propane-autogas-powered shuttle buses. Still, the airport sees some of its biggest cost savings in maintenance. Port Columbus pays an average of $8,000 to $10,000 for each of its propane autogas shuttles. Swackhamer reports the airport saw return on investment with propane autogas shuttles within the first six months. The airport’s “green team” has called the propane-autogas-powered shuttle fleet a success.